So many parts of tonight’s game were utterly absurd. Maybe I need to drink again tonight. There we saw his terrible segue into Andrew’s interview segment about proposing in a graveyard because he wanted his girlfriend’s late relatives to participate in their union. Alex assumed that he was a weirdo, and made a really beautiful story tremendously awkward. Then the Semper Fi for Autumn. If Andrew doubles his score, he’ll have 14,400. 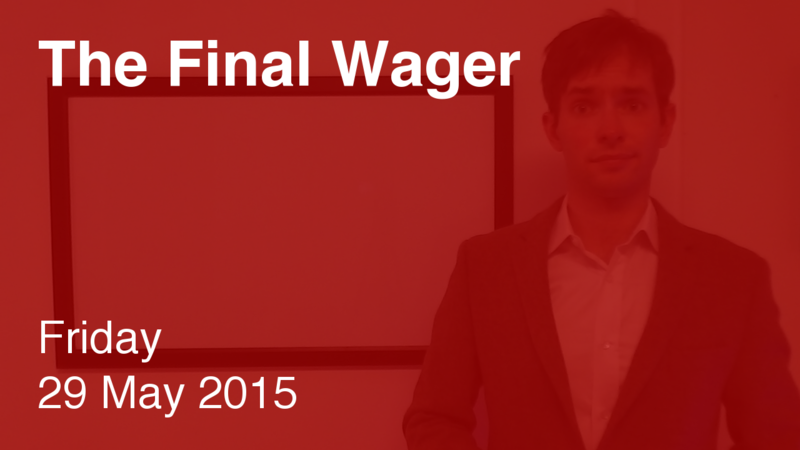 To cover this all-in wager, Dan will need to wager 3,200. An incorrect response with that wager will leave Dan with 8,000. To get above his total, Andrew and Autumn must respond correctly to have a shot, so all-in is the way to go. Andrew should wager at least 3,600 to cover Autumn. I am tempted to give Autumn a yellow or something there, but since Alex spilled the beans, it was unlikely that she would cost herself too much. Still, maybe holding back the $2 wouldn’t have hurt. Dan has now won 4 games and $99,999. Nice total – almost as good as Vaughn Winchell’s $103,103. Funny thing – I’m glad I wasn’t at Andrew’s podium today. With the tough FJ category, I would have stood pat and put all my eggs in Dan’s ambitious wagering streak continuing. Boy, would I have looked stupid. But I think that it was the highest EV play from a poker player’s perspective despite being abyssmal from a game theorist’s. Either way, Dan has to get it wrong. Assuming he does, I think it’s more likely that Dan wagers irrationally than that I get it right. What were the odds that today’s the day he leaves $7,998 on the table? Not sure what you’re suggesting – Andrew still had to get it right to win given Dan’s wager (he would have lost by $799 had he stood pat). And with either wager Andrew will win with a double stumper if Dan misses. Yeah, I’m discussing a play that would have worked out horribly. Given Dan’s past wagers, I really didn’t think he’d wager 3,201. Even the 4,799 wager seemed more likely since. It turns out I was completely wrong. Mens “AND” manus? not Mens “ET” manus?